Is grace fair, or is that the wrong question? We must be careful whenever we speak about God, about God’s work or God’s attributes. We are often inclined to reduce God to what we can understand, humanly speaking. We interpret God through our own categories rather than through the categories Scripture gives us for understanding God and God’s work. This is a good example. There is nothing fair about grace if we look at it through the lens of the cross. Here, one who is wholly innocent suffers and gives his life for the sake of those who are wholly unworthy of his sacrifice. Where is the justice and fairness in this? The one who is crucified prays for those crucifying him: ‘Father, forgive them, for they know not what they do’ (Luke 23:34). He dies as ‘the just for the unjust’ (1 Peter 3:18). This is not ‘fair’ in any sense of the word, but a form of love in which ‘mercy triumphs over justice’ (see James 2:13). Further, there is nothing ‘fair’ about grace when we consider the gift of salvation. Now to him who works, the wages are not counted as grace but as debt. But to him who does not work but believes on Him who justifies the ungodly, his faith is accounted for righteousness (Romans 4:4-5). In these verses the apostle is arguing that we receive salvation, not on the basis of our works, but strictly on account of grace. Paul says that God justifies the ungodly. Not only is grace not ‘fair’, it is a scandal! If a human judge were to rule a guilty person innocent we would rightly be scandalised. How dare God justify the ungodly! And yet this is exactly what grace has done: ‘for when we were without strength, in due time Christ died for the ungodly … God demonstrates his own love toward us in that while we were still sinners, Christ died for us’ (Romans 5:6, 8). Thus, the provision of salvation at the cross of Christ, and its reception in our lives through justification by faith, are both works of divine grace which go far beyond the boundaries of human justice. Human justice is an attempt to regulate human relationships and actions according to a principle of equity. This is important and must not be diminished. It is, perhaps, the best human society can aim for in the conditions of an often very unjust world of competing interests and powers. But we must not confuse human concepts of justice and fairness with the reality of divine grace. 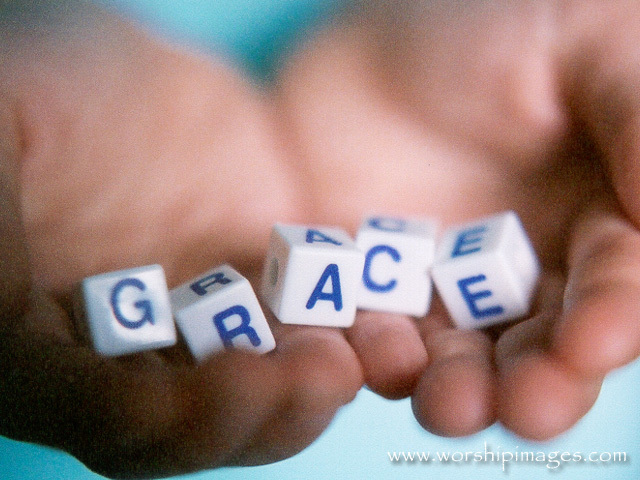 Grace is what God has done for us in Christ in all its scandalous glory. Grace is not so much a concept as an event and an action. Divine grace triumphs over human justice not by negating it, but by going beyond it and doing more than justice could ever imagine. It is a divine restorative justice, justice operating on a higher plain and in a different mode. Grace is certainly a gift—and indeed a very supernatural gift. In fact it epitomises all the gifts of God… But it is a gift—and this must be our a priori definitive description—in so far as the Giver, i.e. God Himself makes Himself the gift, offering Himself to fellowship with the other, and thus showing Himself in relation to the other to be the One who loves. … Grace denotes, comprehensively, the manner in which God, in His essential being, turns towards us. For Karl Barth, grace is the almighty, holy and transcendent God turning in condescending love towards us in order to make peace and create fellowship between God and humanity. Grace is not simply a thing which God has or gives. Grace is God himself turning toward us in love, taking our wrong upon himself and putting it aside. Grace is a divine relational movement in which God acts towards us in love. To the very depths of God being, and to all eternity, God is nothing other than fellowship-creating, peace-making love. This is grace. Barth, Karl, Church Dogmatics II/1 (trans. T.H.L. Parker et al; Edinburgh: T. & T. Clark, 1957), 353-354. The first thing to be said about this psalm is that it is quite possible, even likely, that it should be read with Psalm 10 as a single psalm. The two psalms seem to be an acrostic poem where each line or section begins with the next letter of the alphabet. Psalm 9 starts with the first Hebrew letter, aleph, and concludes with the eleventh letter Kaph – half way through the twenty-two letter alphabet. Psalm 10 then commences with the twelfth letter Lamedh and continues to the end of the alphabet. The pattern is not entire, however; Psalm 9 for instance, omits the fourth letter Daleth, and there are a few difficulties with the pattern in Psalm 10. Nevertheless, Hebrew scholars feel there are good grounds for considering that two psalms should be read together, if not as a single work. The vision and theme of the psalm is of the Lord as the sovereign ruler and judge of all nations. That is, the Lord is the universal sovereign who exercises judgement both for David in his immediate situation, and eschatologically for the whole world. The psalm contrasts the kingdoms of this world – the nations – with the kingdom of God. In New Testament language we might say that the whole psalm breathes the second petition of the Lord’s Prayer: Thy Kingdom come! Verses 1-2 commence as a vow of praise to God Most High (cf. 7:17). Then follows a celebration of God’s judgement of David’s enemies, resulting in their complete and utter ruin (vv. 3-6). They are blotted out and destroyed forever, so that even the very memory of them has perished. In terms of modern sensibilities, this is very troubling indeed, for it seems that the psalmist has co-opted God for his own nationalist purposes, and provides religious validation for violence and hatred of enemies. He is, as usually we all are, convinced of the justness of his own cause, and sees his victory as divine justice. In contrast to the transience of the enemies who have perished, the Lord abides forever. In verses 7-10 David enlarges his vision: not only has God judged in his favour, but he will judge the world in righteousness and with equity. This is an unusual equity, however, for it favours the oppressed and troubled. Verses nine and ten particularly, recall Psalm 2:12, that those who seek refuge in God will not be forgotten or forsaken by God, but rather will be the recipients of his protection and blessing. For many centuries God’s people have found comfort and strength in these verses. On the basis of this hope, then, the psalmist exhorts his listeners to praise (v. 11) and again reiterates that God does not forget the afflicted, but indeed will require or avenge their blood (v. 12). Here again modern sensibilities are affronted; yet the image serves to emphasise the reality and strictness of the divine judgement. God himself will take the cause of the afflicted and oppressed and will visit upon those who oppress them, the same kind of treatment that they have dealt out to others. Verses 13-14 now petition the Lord for his grace (cf. 4:4; 6:2), and anticipate that he shall indeed be gracious. Verse 15 returns to the theme of judgement, and begins with an observation that the nations get caught in their own traps and devices. Like Psalm 7:15-16, this verse suggests that there is a natural moral order functioning in the world, a ‘law’ as it were, of sowing and reaping in which evil intended for others returns upon one’s own head. However, verse 16 suggests that even the apparently impersonal consequences of one’s actions are the direct result of Yahweh’s personal exercise of judgement. Verses 17-18 play on the idea of memory and forgetfulness. The wicked who forget God will ‘return’ to Sheol – where there is no memory of God (cf. 6:5). But the poor and afflicted will not be forgotten, for God remembers them and does not forget their cry (v. 12). Let the nations know that they are but men. After the celebration of humanity’s exalted status in Psalm 8, this plaintive cry brings us back to earth, reminding us of our fallen state and its moral consequences. There is a stark contrast between God and humanity, between human activity and divine justice. There is also a very sharp reminder that we need divine judgement if ultimately, there is to be justice and equity. It seems that human power will always exert itself against God, bringing injustice and oppression to others. The nations forget God (v. 17) and oppress the needy (v. 18). They rage and imagine vain things (2:1). The nations and their leaders strut about upon the stage of history as though they were God. For the psalmist, then, the only hope for peace and equity lies in the hope that God will ultimately judge the nations and thereby bring true justice to pass. In all this, of course, a genuine problem arises: it is difficult to perceive God’s sovereign reign over the nations in our present world. Injustice, human pretension and violence abound. Where are you Lord, in the midst of the ever-present tensions within and among the nations? How long, O Lord, will you allow the powerful to oppress the poor and vulnerable? Why do you delay in coming? Arise O Lord! We, like the psalmist, are called to see what cannot be seen: the universal sovereignty of God. And to believe what is almost impossible to believe: that God will one day put things to rights. In so doing, our hope is wholly placed on God, his faithfulness, his righteousness and his kingdom. And so we pray, Thy Kingdom come! Last night I was MC at an event in Perth in which Hugh Ross, founder and president of Reasons to Believe, and Carl Wieland, Managing Director of Creation Ministries International, engaged for the first time ever in a public forum. The event was billed “A Gracious Dialogue” rather than a debate and it retained a gracious character throughout – for which I am grateful! There was a good turnout – almost 400 people, which is quite outstanding for Perth. The audience Q&A was handled by SMS, and I would do it again like that in a heartbeat: around fifty questions were received and scrutineers sifted them, choosing the most relevant and representative half-dozen. This allowed the best questions to be sourced, while avoiding any grandstanding, preaching or rancor. Given the topic and the heartfelt passion and the division it stimulates, this was a major achievement on the part of the organisers. 1. Why did I get myself into this position? Before the event I was somewhat nervous that it might be less than “gracious,” or that some members of the audience might become inappropriately militant. Happily, that was not the case. Further, and perhaps more to the point, I am neither a scientist nor the son of a scientist. Would I have anything constructive to say? Finally, I have a good friend who can’t believe that I would even give airtime to what he considers one of the more disreputable pursuits of conservative evangelicalism! In his view, giving oxygen to this discussion simply allows the worst aspects of fundamentalist evangelicalism to continue and even thrive. 2. This is an intra-mural discussion that probably has little interest or traction in wider Christian circles, not to mention those outside of Christian faith. It may even appear as incomprehensible to those outside the faith. 3. At base the discussion is a matter of hermeneutics, and so I was interested to see how marginal a role hermeneutical discussion played in the overall dialogue. Both speakers have an explicit commitment to biblical authority and want to find not only that the Bible is not antithetical to the findings of science, but positively corroborates the findings of science. They vigorously advocate their position, but do so differently, in accordance with their hermeneutical presuppositions. Carl Wieland claimed that his position was based simply on the plain meaning of the text, and proceeds to read the science through the lens of this commitment. For Wieland, the biblical text is primary, and his group looks for means to interpret the science in accordance with this a priori conviction. A central feature of this approach is a commitment to a literal global flood, the literal interpretation of the days of creation in Genesis 1 as 24-hour periods, a literal reading of the Genesis genealogies, and many other passages, including Old Testament poetic passages. 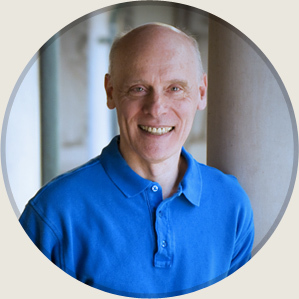 Hugh Ross was more aware of the hermeneutical issues stating that both science and theology are interpretations of nature and Scripture respectively, and acknowledges the possibility of faulty interpretation, especially when conflict arises between the findings in the two fields. Although his appeal to Scripture also includes literal interpretation, even of poetic and proverbial passages, he is prepared to apply metaphorical interpretation when it suits his case (e.g. the word ‘day’ in Genesis 1). 4. Still on hermeneutics, the question must be asked concerning the legitimacy of treating Genesis, or indeed any other biblical text, as a proof-text for a scientific perspective. That this question was not even asked, let alone addressed, is indicative of a troubling oversight. It is anachronistic to read modern scientific theories back into Genesis, or to expect Genesis to speak in a scientific voice to our place in history. Faithful reading of the biblical text is attentive to its original context, vision and purpose. It is far more likely that a faithful reading of Genesis 1-11 will see it as a theological polemic against the cosmogonies which confronted ancient Israel in their cultural environment. It adopts the form of other ancient creation myths, but communicates a very different vision of God, humanity and God’s relation to the world. Its purpose is theological rather than historical or scientific. The question of genre is inescapable here, and reading it as a modern scientific or historical treatise is to mistreat the Scripture. Our understanding of the plain sense of Scripture is culturally conditioned and may, in fact, impose an alien sense onto what the message of the text actually was and is. 5. More hermeneutics: Hugh Ross used the common analogy of ‘God’s two books’ to identify the knowledge which may be gained from nature and Scripture. Why should we expect the ‘two books’ to say the same thing? Why should we expect the Bible to be the full and perhaps only legitimate source of true knowledge? May we allow science to explore the what and how of creation, while allowing Scripture to provide why, that is, the overarching narrative and teleology? 6. Finally, a comment on each presenter’s approach to the topic. Carl Wieland gave an evident primacy and authority to the Scripture and would only accept ‘science’ that conforms to his interpretation of Scripture. At the heart of his argument is the problem of death: an old earth must reckon with the reality of death prior to the sin of humanity. Hugh Ross approaches the topic from the other side, identifying what he considers certain scientific constants, and seeking to show that they are not incompatible with Scripture, and may indeed be found in scriptural imagery. In the end, Wieland is forced to reinterpret science to make it fit with his interpretation of Scripture, and Ross is forced to reinterpret Scripture to allow it to fit with the findings of science. In the end, Wieland’s ‘science’ is less than scientific,and must resort to all kinds of pietistic suppositions about what God could have done or might have done. Ross’ interpretations of Scripture, however, are not illegitimate even though his hermeneutics might be further developed. It appears to me, then, that of the two options, Ross has the better approach and argument. In some respects, Wieland is more consistent in the application of his literal hermeneutic. I get the sense that this is the ground of his appeal with ‘Bible-believing’ congregations. 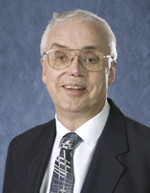 His rhetorical approach is thick with appeal to Scripture verses and references to ‘faithful interpretation’ and ‘the clear meaning of the text’ etc, and thus trades on concepts of biblical authority which resonate so deeply with Evangelicals, especially when they have not developed models for understanding this authority. Fortunately, however, there are other options available to evangelical believers; options which respect the inspiration and authority of Scripture, but which operate with a different understanding of what inspiration entails and how that authority functions. Church as Moral Community – First Review! In a single impressive statement, Michael O’Neil captures the whole theological and ethical drive of the early Barth: “Not only must the old be torn down, but the new must arise” (p. 157). In this extraordinary piece of research, O’Neil presents Barth at his iconoclastic best, demolishing in order to build, and like Luther’s God, killing to make alive. It is this demolishing and killing, this via negativa, that led previous critics to accuse Barth of evacuating all possibilities for moral existence in both the church and the individual. O’Neil argues otherwise: “Barth deliberately develops his theology with an intention to form moral community” (p. 221). While most who read Barth focus on his magnum opus, O’Neil take us back to the early years of his theological development. He carefully lays out the results of his meticulous archaeological dig into Barth’s two Romans, as well as his sermons, letters and lecturers. Here we see Barth’s early twists and turns and delights and disenchantments – all the while struggling to create a theology in response to the moral and political crises engulfing him. O’Neil has sought to chronologically uncover the “development, structure, content, parameters, trajectories and logic of [Barth’s] thought” on the subject of ecclesial and moral existence, covering the years from his break with liberalism to the second edition of Der Römerbrief. As such the book is not only a work of theological ethics, but also to a lesser degree, history, and biography. The primary thesis O’Neil successfully prosecutes is that from his earliest days Barth was vitally concerned with ethics, the church and Christian social engagement with the world. After all, Barth’s search for a new theology was due to his liberal theological teachers’ support for a war: their failed ethics indicated a failed theology, which sent him urgently back to the Bible. Here O’Neil sides with John Webster against the older view that asserted that Barth was ecclesially and ethically thin, which was no doubt aided by his strident rhetoric, such as his description of ethics as sin, and the church as one of many human idolatries. O’Neil argues rather that such rhetoric serves to demolish the liberal, pietistic, religious and idealist views of his day in order to rebuild the church and human moral action on the proper basis of God’s act in Jesus Christ, for with “Jesus the good actually began already, the good to which mankind and nature alike are called, which towers right into our own time and goes forward toward a revelation and consummation” [Barth, ‘Action in Waiting,’ 1915, cited on p. 67f]. After an introductory chapter surveying how Barth’s ethics has been received, chapter two traces Barth’s early struggles and disputes with both liberalism and socialism from 1914 to 1917. This trenchant criticism of the church was in the service of an ethically faithful church and demonstrates that from the very start Barth possessed a pronounced ethical and ecclesial commitment. Chapter three covers the year of Barth’s first Romans commentary (1919). Because Der Römerbrief I emerged out of his pastoral and homiletical struggles, it is necessarily concerned with concrete moral and ecclesial existence. Barth’s rejection of both pietistic withdrawal and Christian and political movements that bypass Christ is grounded in the argument that proper human and historical moral action is a response to God’s prior action in Christ where he broke through into this world. This divine action is an organic process, like a seed growing to maturity, and will finally lead to certain victory. Chapter four covers the interval between Romans I and Romans II (1919-1922). Barth’s indebtedness to the consistent positive eschatology of Christoph Blumhardt and to the negative philosophy of Christian history of the enfant terrible Overbeck, is clearly argued. These influences sharpened Barth’s axe in preparation for the great assault of Romans II. The Tambach lecture also receives detailed exegesis at O’Neil’s deft hand, where Barth’s use of crisis, although used in Romans I, finds greater concentration, presaging its central place in Romans II. Barth’s lecture Biblical Questions, Insights and Vistas (1920) paints true human existence as oriented in an “ec-centric” way to the wholly other God in Christ, who alone brings life out of the crisis of death, noted in Grünewald’s famous painting. And so to Der Römerbrief II, where the previous organic view of the coming kingdom of God fades away and the crisis of being caught in the pincers of the transcendent God’s tangential contact with our world, and our death, takes hold. As a consequence, true human ethical action arises only out of worship and repentance, but arise it does in concrete acts. But these moral acts are temporal moments of responsive action, enabled and informed only by God’s eternal moment of gracious action. This momentary act is pre-eminently neighbour love, the secondary overflow of our primary love for God, to be repeated anew moment by moment as our concrete situation is touched by God’s revelation. Sound unworkable? O’Neil agrees: as Barth sharpened his iconoclastic eschatology and theological transcendence, ethical existence, if not altogether obliterated, becomes extremely precarious. 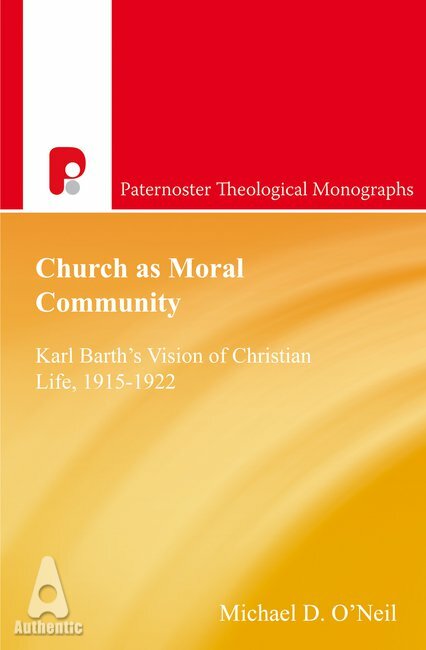 So can Barth be considered to be a moral theologian? Yes, says O’Neil, because Barth is finally saved through his own internal inconsistency, where his theology finally cracks under the weight of his struggle to develop a meta-ethic, a new moral field, upon which he can build a positive account of human and ecclesial existence clear of the debris of the bourgeois theology he has laid waste about him. God’s momentary touch of the world (the theory, Romans 1-11) does indeed perdure for more than a moment (the praxis, Romans 12-13). O’Neil thus argues that it is Barth’s concern for a meta-ethic which has given rise to the criticism that he is too occasionalist and under-specific to be of any help in developing an ethic of character and moral agency. With many citations, O’Neil rehabilitates Barth here: the radical temporality of the ethical moment is a parable of the eternal Moment, where every moral action of the moment must correspond to the reality of God’s eternity, if it is to be considered moral at all. In John’s language, we love because God first loved us. Is the criticism that Barth is ethically thin really a reflection of Kant’s assertion that moral agency must be autonomous to be real? While not exploring this issue, O’Neil paints a convincing picture that in Barth, action that is properly ethical is action that is determined theologically because the untheological self is an impossible reality. Human existence is only truly human when it acknowledges its divine determination, for God wills our existence into existence for the purpose of doing his good will. Thus Barth’s fundamental moral question, “What shall we do?”, highlighted by O’Neil, is lifted from Acts 2:37, thereby setting ethics as a response to the Gospel. Michael O’Neil builds his case thoroughly, exegeting Barth with careful attention to details and history. It is a delight to read his translations of parts of Romans I, as yet unavailable in English. If you are a Barth scholar, an historian of twentieth century theology, or an ethicist, this book will appeal. That Barth’s vision is eminently concrete, practical and active is evident: it was Barth who authored the Barmen Declaration. The text is Colossians 3:1-17. So if you have been raised with Christ, seek the things that are above, where Christ is, seated at the right hand of God. Set your minds on things that are above, not on things that are on earth, for you have died, and your life is hidden with Christ in God. When Christ who is your life is revealed, then you also will be revealed with him in glory. 1. The central feature of this text, and indeed the whole central section of Colossians (i.e. 2:6 – 4:6) concerns our union with Christ and most specifically, our union with Christ in his death and resurrection. We have died with Christ, been buried with Christ, made alive with Christ, raised with Christ so that now our lives are hidden with Christ in God. Why this emphasis? What is going on at Colosse that Paul would write like this? 2. The Colossian church is a young church of young believers, under threat from false teachers who want to lead them into forms of spirituality beyond Christ and in addition to Christ. The false teaching is a curious mix of Jewish legalism, pagan philosophy and mysticism, and religious asceticism (see especially 2:8-23). Paul’s argument is simple: we are already united with Christ in his resurrection: there is nothing else to gain! Our lives are already hidden with Christ in God. We are the heirs of his glory – why, O why would we seek something else somewhere else? In him is all the fulness of the Godhead bodily – and you have been made complete in him (Colossians 2:9-10). Does this mean, therefore, that Christians can be careless about the way they live, that there is nothing to the Christian life? God forbid! Although he does not say here, this is the kind of response Paul would make to this question. For Paul, the Christian life consists in learning to live more deeply from and into our union with Christ – in his death, and in his resurrection. 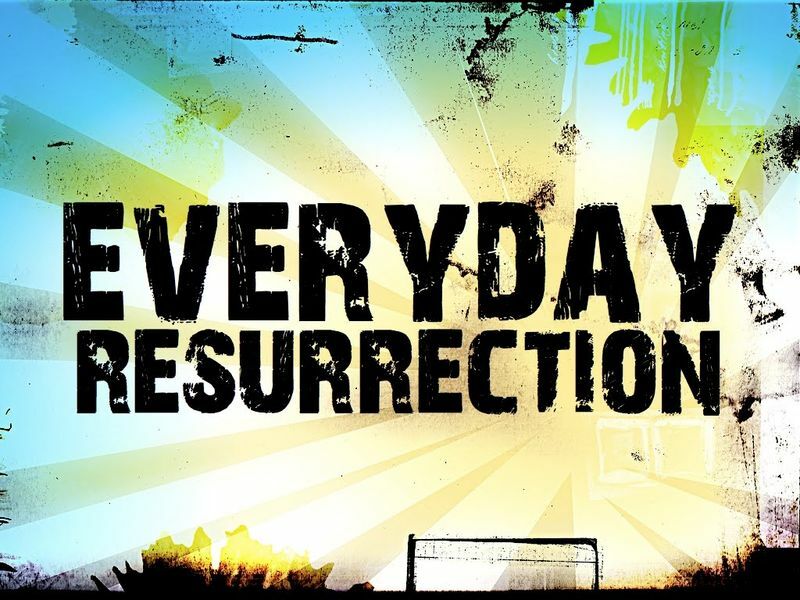 What does it mean to practise resurrection? 3. Learning to Say NO! Colossians 3:5-11 instruct us to “put off” the identity and ways of the old world. What kinds of things are we to ‘put off’? Selfish, unrestrained sexuality, unfettered greed, anger and hatred, prejudice and violence. This is a spirituality of resistance to the ways of the world which are inherently idolatrous and destructive—to ourselves, to others, and to God’s good creation. These things afflict pain on people and destruction on community. God’s grand strategy of redemption does not focus on redeeming isolated individuals; it centers on the creation of a new people, a new community, a new social order that begins to live now the way the Creator intended….The church is a new, visible social order. It is a radical new community visibly living a challenge to the sexual insanity, the racial and social prejudice, and the economic injustice that pervade the rest of society. 4. Learning to say YES! What of the positive content of Christian life, spirituality and ethics? Not only is the community a community of resistance to the ways of the world, but it is also called to positively exhibit the life and character of the coming kingdom. We are called to live the lifestyle of heaven here on earth, the life of the future now in the present. This involves learning what it means to be a community of character, a community of peace, and a community of worship. A spirituality of bearing witness to a radically new kind of life in community, where love of God and love of others is the foundation and goal of all we do. Well, the morning (not necessarily the sermon!) went well. Mt Hawthorn Community is not a conservative congregation, but they are intelligent and thoughtful and bring a good level of discussion, reflection and question to their faith. The sermon moved to discussion during point four above and the discussion continued for 20 minutes during the service, and then for a further 30 or 40 minutes afterwards. One of the things I appreciate at Mt Hawthorn is that every sermon is followed by a time of Q&A during which the congregation engage with the material. It helps keep preaching honest and grounded. The German Christians made the decision in November 1933 that they wanted to purify the gospel “from all Oriental distortion.” With that they accomplished the very opposite – they distorted the message. There have been for a long time and there are also today tendencies to subject the figure of Jesus Christ attested to us in Scripture to the favorite ideas of a particular point in time – until we discover one day that we can satisfy our ideals really much better without this figure! It will constantly be a Reformational act when one moves away from such fantasies to the hearing of Holy Scripture. From: Eberhard Busch, The Barmen Theses Then and Now, 24-25. Dietrich Bonhoeffer, a witness of Jesus Christ among his brethren. Born February 4, 1906 in Breslau. Died April 9, 1945 in Flossenbürg. An English officer imprisoned with Bonhoeffer later recorded Bonhoeffer’s last day: “On Sunday, April 8, 1945, Pastor Bonhoeffer conducted a little service of worship and spoke to us in a way that went to the heart of all of us. He found just the right words to express the spirit of our imprisonment, the thoughts and the resolutions it had brought us. He had hardly ended his last prayer when the door opened and two civilians entered. They said, “Prisoner Bonhoeffer, come with us.” That had only one meaning for all prisoners—the gallows. We said good-bye to him. He took me aside: “This is the end, but for me it is the beginning of life.” The next day he was hanged in Flossenburg.” Bonhoeffer’s final text on that day was “With his stripes are we healed” (Isaiah 53; 1 Peter 2). Every day brings to the Christian many hours in which they will be alone in an unchristian environment. These are the times of testing. This is the test of true meditation and true Christian community. Has the fellowship served to make the individual free, strong, and mature, or has it made them weak and dependent? Has it taken them by the hand for a while in order that they may learn again to walk by themself, or has it made them uneasy and unsure? This is one of the most searching and critical questions that can be put to any Christian fellowship. … Has it transported for a moment into a spiritual ecstasy that vanishes when everyday life returns, or has it lodged the Word of God so securely and deeply in his heart that it holds and fortifies him, impelling him to active love, to obedience, to good works. Only the day can decide. 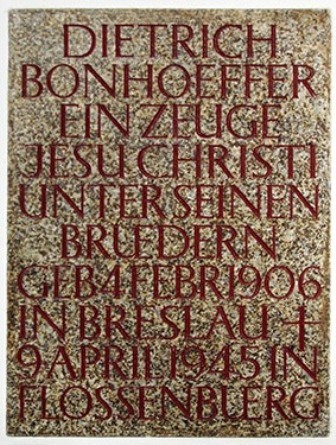 The citation comes from Bonhoeffer’s Life Together (88). Over the next week or two I will remember Bonhoeffer by posting some reflections on this little treatise, which has become a modern theological and pastoral classic. Why not grab a copy and read along? That the theme of the book concerns the gracious God: God is “concerned” for Assyria’s troubles and so sends Jonah to preach grace to them. Jonah is thus the foil in the story, his hatred of Assyria is contrasted with God’s love of Assyria, and this contrast forms the central message of the book. I do not have sufficient knowledge of Ancient Near Eastern history to comment on Assyria’s so-called “troubles.” I find, however, that I am not convinced by Stuart’s argument that chapter 1:2 should be translated “their trouble is of concern to me.” He does not consider the implausibility of Ninevah’s repentance, nor its lack of corroboration elsewhere, and most especially in Nahum. Surely if Ninevah’s repentance was as thorough-going as Jonah suggests, Nahum would have had cause to mention it. Some people worry that if Jonah is not absolutely historical then the Bible is somehow “wrong” or “not true.” This is too simplistic an understanding of the nature of Scripture which regularly uses all kinds of metaphor, imagery, and even fiction to convey truth (Jesus’ parables spring immediately to mind, as does the apocalyptic imagery of Revelation). Some people also worry that if Jonah is not absolutely historical then Jesus’ comparison of his own death, burial and resurrection with Jonah’s experience is somehow undermined (Matthew 12:40-41). Again, this does not follow. The point Jesus is making stands whether Jonah is understood as historical or not. Jesus appeals to a story commonly known and embedded in the cultural memory of his audience. To argue further that if Jesus thought Jonah was historical when in fact it was not, is to render Jesus “wrong,” or even worse, untruthful. But this argument borders on being docetic – of undermining the true humanity of Jesus as a man of his time. For another look at this topic see the article by RJS at Jesus Creed. 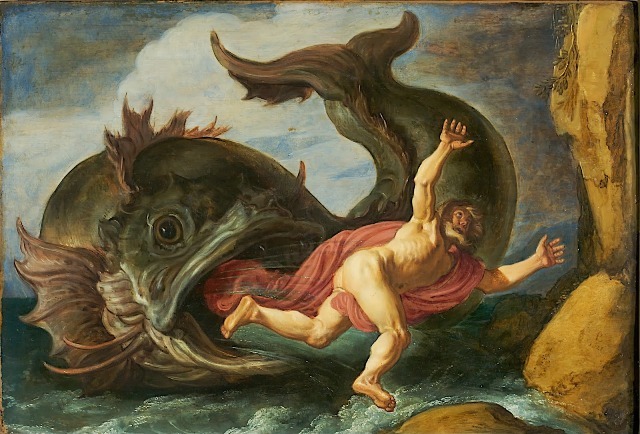 How do you understand the story of Jonah? 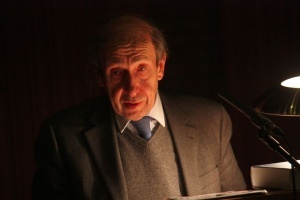 Derek Kidner suggests that “this psalm is an unsurpassed example of what a hymn should be, celebrating as it does the glory and grace of God, rehearsing who he is and what he has done, and relating us and our world to him; all with a masterly economy of words and in a spirit of mingled joy and awe” (65-66). From the highest heaven to the lowest earth God’s majestic glory is declared, made known and acknowledged. The theme of the psalm concerns the greatness and goodness of God and the small but significant human. 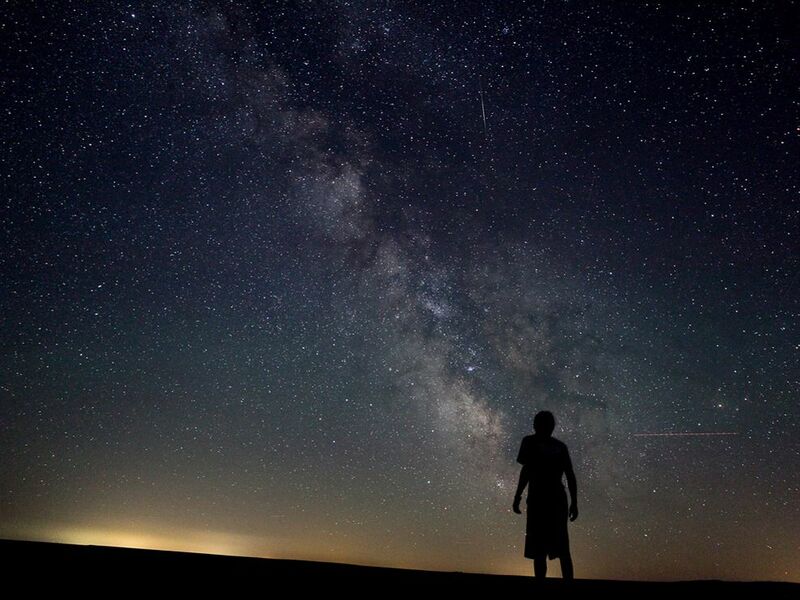 In light of the vastness, glory and intricacy of creation the psalmist is compelled to ask, “What is man that you take thought of him?” The focus of the psalm on the great and special privilege given to humanity occurs within the overarching focus on the sovereignty and majesty of God which frames the psalm in verses one and nine. It is perhaps significant here, that this psalm does not teach a kind of natural theology or revelation (see Craigie). That is, humanity cannot ascertain its own true nature, nor its creational task, by looking at the world of nature. We may be awed by the splendor of nature, but it does not communicate a divine word to us; for that, we need the revelation of God’s name which is proclaimed in all the earth, and the revelation given to us in Scripture, for the psalm itself includes a meditation on the word of Scripture given in Genesis 1. The comparison between God and humanity may be extended. God’s glory and majesty is inherent, revealed in the vast and mighty work of creation. The creation, which is so great that we are dwarfed in comparison, is but the work of God’s fingers. The greatness of God far surpasses the greatness of creation! Nevertheless, the glory of the heavens evokes praise, so that even children are aware of God’s awesome greatness – to the shame of those who would repudiate God’s existence, rule and justice. Humanity’s glory, in contrast, is derivative, bestowed by God in the act of creation as the crown of all God’s creatures, and in the constant remembrance by which God calls the human creature to mind. This is a dignity given by grace, a dignity given to every person, and constantly renewed as each person is the object of God’s particular care and concern. Amongst all the creatures, only humanity is crowned with glory and majesty. Verses six through eight indicate the creational task given to humanity: to “rule” over the works of God’s hands. This task echoes the creational ordinance of Genesis 1:26, 28. Created in the divine image, humanity is to rule over the other living beings. It is crucial that this text be understood within the cultural milieu in which it was written. Biblical scholars suggest that the creation stories picture the world and all its creatures as a temple for the praise of God’s glory. Humanity in God’s image are a priesthood within this temple charged with the task serving and caring for this temple, representing God to the creatures, and offering acceptable worship to the creator. This vision of priestly stewardship has, of course, been drastically altered by the reality of the Fall, so that even creation has been implicated and altered in humanity’s turning away from God. Indeed, as the author of the letter to the Hebrews plainly notes, “But now we do not yet see all things subjected to him. But we see Jesus…” (Hebrews 2:8-9). The New Testament clearly and unambiguously applies this psalm to Jesus Christ, both here in Hebrews and elsewhere. Humanity in general has failed in its creational task and forfeited its distinguished role. But Jesus Christ has come as the truly human person, and in his incarnation, suffering and death, was made for a time “lower than the angels,” but now is crowned with glory and honour. The One who tasted death for all has now been so exalted that all things are under his feet (Ephesians 1:22; 1 Corinthians 15:25-27). Jesus himself cited this psalm on the day of his triumphant entry into Jerusalem when the children cried out, “Hosanna to the Son of David!” (Matthew 21:15-17). Jesus Christ is the “real humanity,” the true “Son of Man” in both the earthly and eschatological sense. In our place and on our behalf he has taken and borne human weakness and fallenness in order to redeem us and restore us to a position in which we share his glory, honour and dominion. Authentic humanity is fully and truly realised in Christ, and we find our identity and destiny in him. By the Spirit believers are being renewed and transformed into his image, restored to truly human life and existence (see 1 Corinthians 15:49; 2 Corinthians 3:17-18; Ephesians 4:20-24; Colossians 3:8-11). True human being and identity is a christological and eschatological reality. Later this month I have been asked to MC a “gracious dialogue” between Dr Hugh Ross and Dr Carl Wieland, who are both in Perth by happy happenstance! The two leaders of their respective organisations, Drs Ross and Wieland represent two divergent views concerning the When of creation: is the earth billions of years old, or is its age to be measured in the thousands of years? Both scientists will present the case for their view, engage each other with questions, and respond to questions from the audience. This will be the first time these two gentlemen have met, and it promises to be an interesting and informative evening. 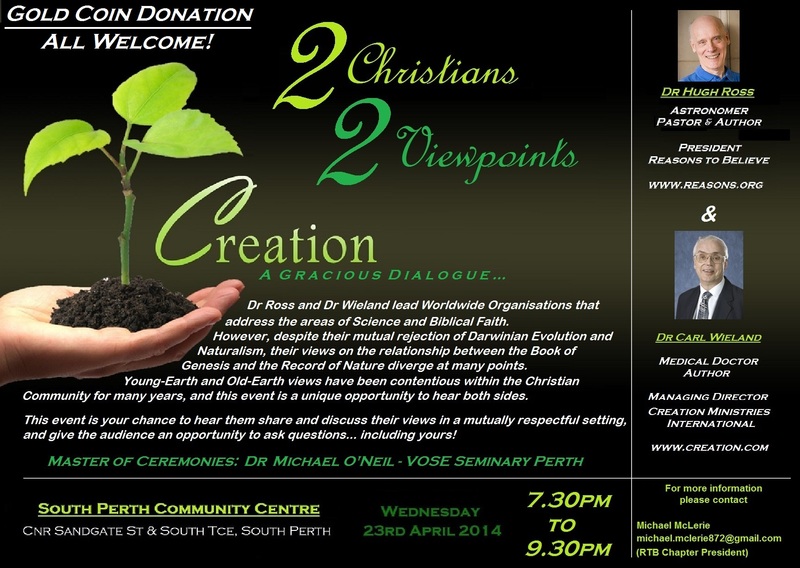 If you’re in WA and interested in the relation of science and faith, science and Scripture, why not plan to join us in South Perth on April 23rd?